Apple’s iPhone 4S (s aapl) has helped it regain ground lost to Android in consumer smartphone market share, but it’s also having a very positive effect on enterprise adoption, according to a new report. The iPad also remains virtually the only choice when it comes to tablets in business. Enterprise mobile security provider Good Technology on Wednesday released its quarterly data report for the fourth quarter of 2011. The report detailed the progress of iOS and Android (s goog) devices in enterprise activations among its customers, which include half the companies on the Fortune 100, among others. Apple’s iPhone 4S was the big winner of the quarter, nabbing the top spot as the most-activated device, followed by the iPhone 4 and iPad 2 at Nos. 2 and 3, respectively. 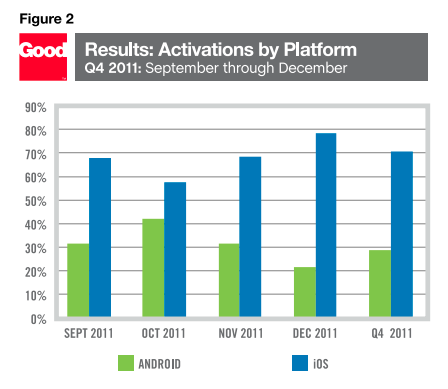 The 4S represented 31 percent of all device activations counted during the quarter, nearly matching the total for all Android handsets, which accounted for 35 percent of all smartphone activations. Apple’s iPad 2 and iPad together accounted for 94 percent of all tablet activations. Much like we’ve seen with new consumer device purchases, the release of Apple’s iPhone 4S in October began the reversal of a trend in which new Android activations were approaching Apple’s numbers, as you can see in the chart below. From October to December, Good saw a steady monthly increase in the percentage of iOS activations, matched by a decrease in Android device activations. Good says bring-your-own-device (BYOD) policies likely had a strong impact on Apple’s enterprise success with the iPhone 4S. A new phone from Apple was bound to incite a buying spree, but the numbers have remained strong in the months following launch. It will be interesting to see if the trend of growth continues, both in the consumer and enterprise markets, now that the 4S has been on the market for some time. 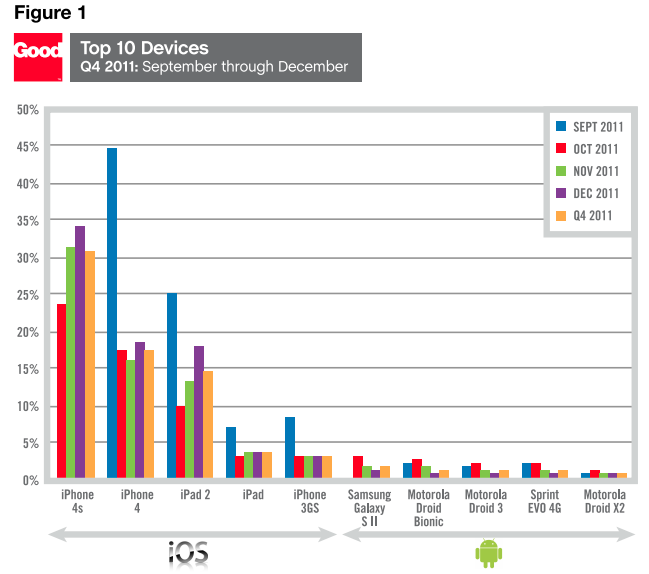 Interesting trend, although I doubt that enterprise users are buying the iPhone 4S just because it’s the ‘4S’. I would bet that it’s more based on the Apps and functionality that you can gain in the enterprise by having all of your critical information in an easy to use way right in front of you. With the current enterprise apps available today a mobile user can gain silo’ed insight into their business like never before. Although this does not account for Siri, which is certainly a huge selling point. I design enterprise apps, and the simple question of what we develop leads us to iOS. What exactly are we to standardize on in the Android Ecosphere? I stated a few weeks ago that the iPad would now become the defacto corporate tablet, because Android did not catch up, and mobility has hit the enterprise hard. We have to move fast, and that leaves us a single option. I developed a CMS build process for magazines and catalogs, as well as music experiences (pre-LP), and I really did think that Android would focus on tools and APIs. Google did not, and it is going to haunt the platform in perpetuity. HTML5 and standard platforms are a mirage at the moment, which leaves a single clear channel, where consistency is a given.